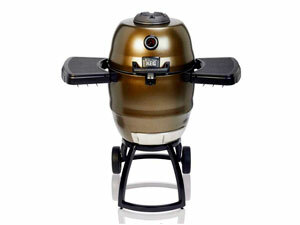 This Kamado-style charcoal grill is able to achieve superior cooking performance with convection style cooking. 480 square inches of total cooking space are chrome plated to resist rust and corrosion. The grill comes with a secondary cooking rack to finish off whatever you are cooking. For easy portability, the grill is equipped with large durable wheels. The removable side shelves provide users with extra space while cooking. The cooking chamber has been coated with porcelain to be rust resistant. The grill has 10-year warranty on its body and 2-year warranty on all remaining parts. The grill has been insulated in an excellent way. It holds heat inside to provide the right temperature for the food and sustains that temperature, without letting the exterior get uncomfortably hot. The efficient design of the grill provides the users to reuse any leftover charcoal from a previous cookout. It needs charcoal in small amounts and cuts down fuel costs. The grill can achieve temperatures as low as 250 degrees for low and slow cooking, and as high as 900 degrees for hot and fast cooking. So users can cook different dishes in different styles with ease. With easy assembling and an explanatory manual inclusive of illustrations, users can assemble the grill within minutes without any hassle or putting tiresome efforts. The grate, lid and grill body have been manufactured with the best quality materials to make the grill have a long lasting life without much wear and tear. Some users might experience that the daisy wheel on top leaks when it gets wet or is rained on. Some users may also find it difficult to fit a horizontally-placed electric starter in the keg’s lower door vent, the charcoal grate, and the charcoal bowl. To successfully achieve the temperatures users want with perfection, might require some practice and time to do, especially maintaining low temperatures. Broil King Steel Keg BKK4000 Charcoal Grill for Convection-Style Cooking is for anyone who wants a grill which is sturdy, lasts long, provides the best heating, maintains the right temperature without getting too hot and has additional features to make the grilling experience more comfortable and easy. With some practice, users can use the grill to cook and grill all kinds of different dishes.